As I write this post, I’m enjoying a bowl of this curry for lunch, and I can’t even tell you how delicious it is. But for you, I will try. This recipe was inspired by a new favorite takeout dish from one of our go-to Thai restaurants in Portland (find our dining guide here!). I’ve strayed from my usual Pad Thai and ventured into greener pastures. Or in this case, yellow curry pastures. And I don’t think there’s any turning back. This recipe is simple, requiring just 30 minutes and 1 pot, which makes it perfect for weeknight meals when you need something fast, delicious, and satisfying. The base of this curry is garlic, ginger, serrano or Thai pepper, and shallot. Next comes red curry paste and plenty of turmeric and lemon juice for that intense yellow curry flavor and color. Coconut milk adds creamy texture, coconut sugar sweetens the dish naturally, and red bell pepper, green peas, mango, and cashews are the delicious add-ins that make this dish insanely beautiful and filling. This curry is fabulous when you’re craving Thai food that’s quick and hearty. And because it’s so satisfying and flavorful, I think it would be especially great for hosting as it’s sure to please even the heartiest eaters. If you give this recipe a try, let us know! We love hearing from you. Leave a comment, rate it, and don’t forget to tag a picture #minimalistbaker on Instagram! We’d love to see your curry in action. Cheers! 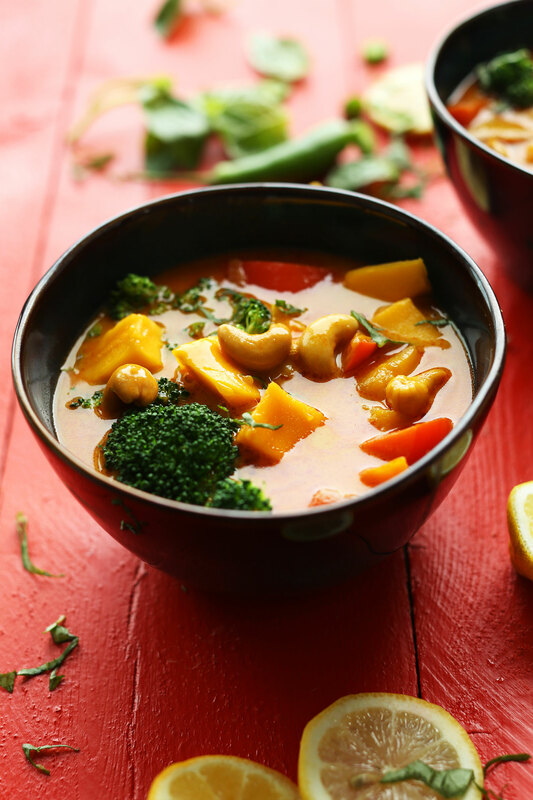 Rich, flavorful Thai Yellow Curry with mango, red bell pepper, and cashews! It all comes together in 30 minutes and 1 pot. Serve with rice or steamed broccoli for an incredibly satisfying plant-based meal! Heat a large cast iron or metal skillet with a high rim over medium heat. Once hot, add coconut oil, shallot, ginger, garlic, and pepper. Add a pinch of sea salt and sauté for 2-3 minutes, stirring frequently. Add cabbage (optional) and red curry paste and stir, and cook for 2 minutes more. Add coconut milk, coconut sugar, sea salt, tamari, turmeric and stir. Bring to a simmer over medium heat. Once simmering, add red pepper and peas (optional) and slightly reduce heat. You want a simmer, not a boil, which should be around low to medium-low heat. Cook for 5-10 minutes, stirring occasionally, to soften the pepper and peas, and infuse them with curry flavor. At this time also taste and adjust the flavor of the broth as needed. I added more coconut sugar for sweetness, tamari and sea salt for saltiness, and turmeric for earthiness. You can also add more curry paste for more spice and intense curry flavor. Don't be shy with seasonings - this curry should be very flavorful. 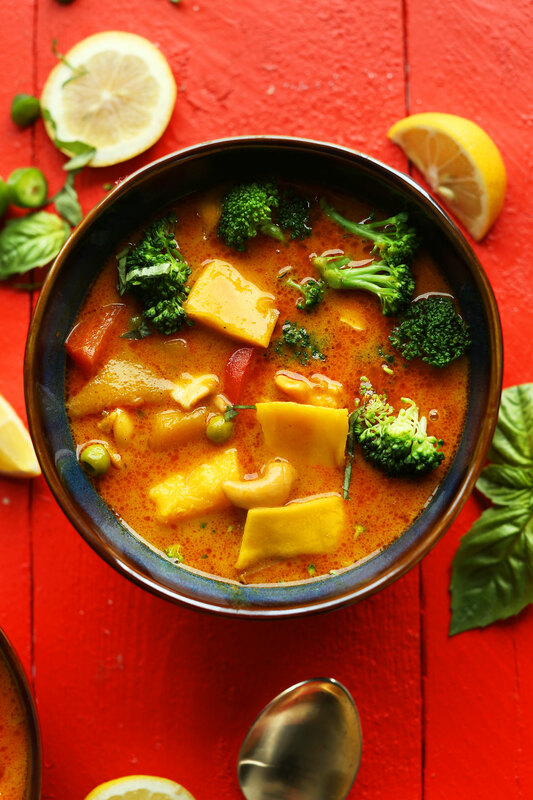 Once the broth is well seasoned and the peppers are softened, add mango, cashews and lemon juice, and simmer for 3-4 minutes more over low to medium-low heat. Serve over rice or coconut quinoa, or steamed broccoli (broccoli being my favorite). This dish gets elevated with the addition of more lemon juice and Thai or regular basil. *Ensure your curry paste is vegan friendly (and does not contain fish ingredients). I love this brand. Made it according to recipe. Ate it with combo of little rice and broccoli, as well as Dana’s baked crispy peanut tofu. Incredible recipes! Love ❤️ and can’t wait to have again. Thank you so much for sharing Dana! Hi! In the video it says that you’re adding tomato paste, while this is not in the recipe. Is there tomato paste in this or just the red curry paste? I made it and it was really delicious. Absolutely love this receipe. I also add chicken to make a yellow curry chicken. It is so delicious and satisfying. Would recommend to anyone and I have had nothing but positive feedback! We’re glad to hear that, Mike! Thanks for sharing! Damn Damn good. Threw some small blanched potatoes in as well….plus lots of basil. Wow !!! Really nice, my wife is vegetarian and am not, but I do most cooking after work so this time I try to test her with a vege dish and all I have to say wow, she loved it and so am I, I made a slit change by adding a full jalapeño pepper for Khoi flava. Yay! Thanks for sharing, Soloman! Just tried this, it’s delicious! How long can I keep it in the refrigerator? Up to a week refrigerated, and freeze for any longer! Yum! My BFF, recently married, went from take out queen to gourmet chef. She revealed her secret and sent me a link to this blog. Hooray! I followed it step by step, tasting and modifying as I went. Oh to be informed on how to DO that! My not so food-adventurous husband and my our little one LOVED this dish. I have red curry paste cubes freezing and I am certain I’ve reached some new pinnacle of … I don’t know, but something. Just made this after seeing shutthekaleup’s post on IG! Added some green beans (to use them up) with the other veggies also used your suggested 1 can of coconut milk + 1 can of lite coconut milk and mmMmm so creamy and delish. Plus, it looks so pretty too! Makes me feel like a pro :) I went for a slightly lemony flavor so added a bit more lemon but now I want to try infusing some lemongrass into it next time I make it. Thanks, Dana for another wonderfully fool proof recipe that was fun and fully customizable. Do you think this would be suitable for freezing? Yes! See Nancy’s comment above for tips. Made this tonight – delicious! Tastes better than takeout! I poured this over steamed broccoli as suggested, and served with naan. My (non-vegan) husband LOVED it! Yay! Glad to hear it, Alex! Hi Dana ….what a delicious recipe! I made a few changes based on my pantry ….used 1 can full fat coconut milk & 4 cups unsalted vegetable stock. Your recipe is now on my regular rotation. Thank you! Just made this and what a winner it is!! My mangoes weren’t ripe so I threw them in with the peppers and peas so that they would infuse better. I didn’t change much else cuz this recipe is perfect! I made jasmine rice and qunioa to go with it. This sounds amazing. I’m doing Whole30 so can’t have the sugar. What adjustments would you recommend if I omit the sugar? Thanks! Hi! Others have left it out and still had success with it! I made this and found that if you dont include the tamari or soy sauce it’s too bland. You definitely need the salt! This recipe was perfect and actually tastes better than from my favorite restaurant! But instead of using mangos, I used fresh pineapple cut into chunks. I also like it a little spicey, so I added a second pepper. Then basil leaves in the last few minutes and served over white rice and broccoli was great. I made this for my family tonight and every plate was clean! My husband ate 2 servings and is excited to eat more at work tomorrow. I had peanut butter and bread on the table just in case my kids (3 and 4 1/2) weren’t into the curry, but they sat untouched. Each of my boys ate 2 servings! And our daughter (1) couldn’t get enough of it. Thanks for such a great recipe that my whole family enjoyed so much! This is so good and flavorful! I used full fat coconut milk and brown sugar and it still came out great. Made this dish! It was super delicious! My husband loved it. Thanks for the recipe!!! I absolutely love Thai food, and I am always interested in making my favorite dishes at home. This was so filling and so darn DELICIOUS!! I am a meat eater, but am currently making an effort to cut out gluten and dairy products, and this was an awesome awesome dish for me! For meat eaters who are interested, I added chicken seasoned with turmeric, red curry powder, cumin, salt and pepper, and it went really well with the dish. Also added cubed potatoes. My family loved it, and I am so so happy I found the Minimalist Baker! You are rapidly changing how I view healthy/clean eating for the better. Your website is making it so darn easy to eat well! Thank you so much! Made this for dinner tonight! Huge hit with the whole fam!!! Absolutely delightful!! Thank you for such a delicious and simple recipe. Just made and LOVED! We added potatoes. Yum. Little too spicy for the kiddos, so I may let up on the chili paste and add it to my and hub’s bowls after cooking. Easy and fast. THIS IS SO GOOD! At this moment, it is sitting on the stove while I wait for my husband to get home and I can’t stop sneaking tastes! Thank you again for a delicious recipe :) We make at least 2 of your recipes a week! Hello, I want to ask if we can use frozen mangoes if fresh mangoes are not in season. If so, what is the mass of the frozen mangoes required to substitute for the recipe? We just made and ate this curry accompanied by the Thai Carrot Salad. It was indeed delicious. But if you can prepare the ingredients in 8 minutes your name must be Speedy Gonzalez. So our family had to wait for their dinner a little longer than planned. It was worth the wait though. Thanks so much–I love your website! I just looked up the recipe for brown rice on Saveur you posted. Is that seriously 12 cups of water, a typo, or am I reading it wrong? Hi Eugenie! Yes, 12 cups of water is correct! Thank you! I am going to try this! I’ve never commented on a food blog before. I’m vegan and my boyfriend wanted a mango curry ? so I googled and I had seen this blog before. Headed straight for the shops cooked it up absolutely love it ❤️… not to spicy or sweet.. great flavour we ate it with brown rice and purple sprouting.. we also nearly ate all four portions ?????? LOVE this soup & so does my husband!! I’m just starting to experiment with curry (I’ve never really been a fan) but ohhhh my goodness this soup is seriously perfection! This was Fabulous!! I used 1 can of full fat coconut milk and then put this over udon noodles. For leftovers I poured the sauce over steamed broccoli and cauliflower – sooo good! Perfect amount of spice and flavor with not that many ingredients. Loved that it came together so quickly too- great job putting this recipe together! Very good! Although I wasn’t sure if I should have peeled the mango or not? The mango should be peeled! Glad you enjoyed it! Another delicious recipe on this blog. I discovered Thai food just a little while ago and I’m addicted. I could have the red curry with peanut sauce from my local restaurant three meals a day everyday! But this was seriously great. My first try at cooking Thai curry. I added prepared tofu and I went with the broccoli too. I only added one tablespoon of sugar. Next time I will omit the mangoes entirely. They were good but don’t reheat well and I like to cut sweets out wherever I can. This is awesome though and I look forward to experimenting with different veggies which I think is the beauty of curry. My husband and five year old son loved it too they give it four thumbs way up. Seriously one of the best things I’ve ever made. A Thai restaurant couldn’t have done it better. Minus cashews and red bell, but I added broccoli at the end instead of steaming. Thank you Dana for loving food and creating these healthy recipes that are easy to make. Love this recipe! Amazing recipe! My husband and I make this minimum of once a month and it’s delicious every time. I have made this with both the serrano and thai chiles and you really need the thai ones for it to have it’s kick. We’ve also sautéed extra firm tofu and added it for protein which makes it stay with you a bit longer. I also prefer using just plain table sugar over the coconut sugar as I find it tastes better and is easier to find. Pro-tip, the curry sauce on it’s own actually freezes quite well. We have started bulk making this by putting all the ingredients through the thai chili in a food processor to save on chopping and making it in quadruple batches. Stop at the end of step 3 and freeze and you can thaw it out later to chuck the veggies in. I made this last night! It was surprisingly simple, although I’ve discovered chopping mangoes is harder than I thought. It was very “saucy” (which is fine as the sauce is DELICIOUS) but now that I’ve made the base sauce, I’ll experiment in the future with different veggies. I made mine with broccoli and coconut quinoa – definitely recommend. I’ve made a few of your recipes, each one being a resounding success, but I must say this one is my absolute favorite! I’ve made it twice in the last three weeks, and as it’s enough to feed me for about 8 meals, that’s a lot of curry time… Just finished eating the second batch and already planning when I’ll make it next. Thanks for creating and sharing such a great recipe! p.s. I’ve been experimenting with different additions, and thus far adding some paneer cheese I made the day before was epically delish, as were carrots and tofu. Another winner!! Like every other entree recipe, this was delish (and is making going vegan super easy)! I substituted carrot for bell pepper (don’t like it) and added more curry paste and turmeric with plenty of broccoli and brown rice :) I was at first hesitant about using mango but absolutely love it!! I order curry sauce when I order pad Thai and mix them together. Or I order a curry like this and a side of steamed rice noodles instead of rice and mix those together, its so delicious. The best of pad Thai and curry worlds. This was so so so so good. Even my meat eater (picky eater also) husband loved it. For some reason i thought it had tofu (or tofu was in my mind) and I had it prepped only to find out that it didnt. So i added it anyways. I added it a couple of minutes before adding the mango and it came out great. Thanks for all your recipes, is making my transition to vegan so much easier. Simple meals, healthy and delicious, cannot ask for more. YOU ROCK! Made this a few days ago for dinner – I think it was the best curry I’ve ever made, and maybe one of the best I’ve ever eaten! I changed the vegetables a bit based on what I had – eggplant, zucchini, and bell pepper. I also didn’t have light coconut milk, but used 1.5 cans of full-fat coconut milk and added half a can of water, which worked just fine! Serving it over broccoli was SUCH good idea! Makes it so much healthier than rice. Definitely my new favorite curry recipe. Thank you for this recipe. I made it today for lunch and it was delicious. This is probably one of the best recipes I’ve ever tried! I could literally bathe in it! Thank you!! Thanks so much for this recipe! I made this for my family tonight and they enjoyed it! 5 stars! I picked out this recipe and bought the ingredients, but my husband made it. Ready to go with brown rice when I came home from work. Smelled wonderful. Tasted even better. My new favorite curry. I highly recommend this recipe to anyone. Thank you, Dana. Delicious! Easy to make, with great flavors — my wife really liked the combo of sweetness and heat. Thank you! Love ur recipes! I usually triple up the size, portion it up, and eat them all week. How would a dish like like this (with fruit) hold? Do u think it would last at least a few days or would the mangos get over ripened?? Made this tonight for my boyfriends birthday and it was DELICIOUS. We have been eyeing this recipe for a while and I thought tonight would be a great night for it especially considering our Florida summer. This was so refreshing, perfectly spicy, and well balanced. I added tofu and green pepper since we didn’t have broccoli, but everything turned out great. We otherwise followed the recipe to a t. Will definitely be making this again! Thanks Dana! This is EASILY one of my favorite recipes. Thank you so much! Made this for dinner tonight and it was phenomenol. Even my husband, who can sometimes sneer at sweet things, loved this with the mango and all. I’m shocked really. A true testament to how good this was. This dish is delicious. I’m not vegetarian, vegan nor do I have a gluten intolerance but I have made almost every recipe on your site. This is one of my favorite dishes and you are incredible at what you do, you’re truly gifted. Made this for dinner tonight and it was amazing! Like others I made a few adjustments. I didn’t add the peppers (because I can’t stand peppers), and added broccoli and snow peas for veggies and some cubed tofu for protein. I also looked up Thai yellow curry and saw that some of the other spices it traditionally contains are cumin and fenugreek, which I have in my spice cupboard, so I tossed in a teaspoon or two if each. Also used lime instead of lemon and served it over coconut jasmine rice. Absolutely brilliant! Lovely! Thanks for sharing, Samantha! So delicious! I mixed up the veggies and added tofu but kept the broth as is. I want to drink it!!! at what stage do you add tofu in? I tried this mango curry for dinner today. It’s soooooo delicious and easy to make. We served it on rice and we also had it together with carrot bread. Love it, thanks! Wow! Thanks for this lovely recipe. I have made this twice now and it just keeps getting better. I added tempeh and minced lime leaf. I hope your readers make this at least once and discover the magic. Love the addition of tempeh! Made this last night for the first time! Added zucchini, broccoli, and doubled the red pepper to bulk it out, topped it with crispy tofu because of a cashew allergy and served it over cauliflower rice! SO GOOD. The mango really adds something special to this. This turned out great! I used fish sauce instead of tamari and full fat coconut milk which made it really rich. Oh and I added lime leaves too! I served with broccoli, basil and coconut jasmine rice and it was 4 generous servings. Only complaint was the prep time. Took me about an hour to get everything organized but maybe I’m slow! Amazing! My new go to! Works with green curry paste too, just don’t add the turmeric. Also good with 1 can of almond milk and 1 coconut milk. Thank you for this great recipie! Thanks for the comment – I think I might try your variation of the recipe tonight! I made this recipe about a week ago with some sweet potatoes and spinach and it was exactly what I hoped for taste-wise. However, I was worried about the saturated fat content and was wondering if almond milk might work as a replacement for one of the light coconut milk cans. Now I can make it again guilt-free! After waiting a week to make this because my mango would not ripen, I finally made it tonight. As someone else did, I also only used one can of coconut milk, as well as only one mango, which gave rise to a thick sauce that I loved. I think it would have been better if I let my mango ripen longer as I didn’t find this one giving me the mango flavour I wanted, but that’s entirely me. I would highly recommend this recipe. Thank you! making this tonight for dinner and I am soooo excited! I absolutely adore curries, and this one looks amazing. I’m so excited to make this recipe tonight! Wew! Super random yet precise question: The second picture down in the article (on the cutting board)…what is the vegetable on the far left? Is it bamboo shoot? Woaah! Just had it for a late lunch. Sooo good! I packed for tomorrow to take some for my lunch break at work and just thinking about it makes my rainy day happier. This curry was wonderful and so easy to make! I also made your Cheesy Jalapeno corn dip last week and took it to a non vegan BBQ it was very very addictive. I’m so excited for your new cookbook to arrive! Thank you for making a plant based diet easy and delicious. Since I stumbled upon your site I no longer dread figuring out my weekly menus. It has put the enjoyment of cooking back to our household. This one is beyond amazing. I want to make this every week. We added some medium firm tofu which was awesome. The flavors on this are out of control. Thank you for existing and bringing this amazing food to our tables. I love love love this blog. This is a win. The supermarket was out of ripe mangoes, so I cubed and baked an acorn squash as a substitute. Amazingly tasty, and my roommate agrees! I made this curry tonight and I will be taking it to a friend tomorrow who is fighting colon cancer and has quite a few dietary restrictions. The flavors are phenomenal. I made it because I had a mango sitting around and thought, why not? I only used half a seeded serrano, two cups of peas, one mango, one red bell pepper. No nuts, but I do think some broccolli or cauliflower would go well. Also adding chicken wouldn’t be bad. My six year old is a fan!!!! Someone recently gifted us a huge fruit basket (yes, really!) and the mango was starting to look a little sad, so this recipe was perfect. I omitted the turmeric and used yellow curry paste from the Fair Trade brand in the Netherlands, which is vegan as well. I’ll definitely make this again! I love this recipe. I doubled the batch and added chick peas to it for a dinner party I went to. It was amazing! We love this, I’ve already made it twice. The first time I added broccoli and served it on rice The second I put it over quinoa. It will definately be in our dinner rotation for as long as mangoes are on the store shelves. Holy cow! Just finished making this and it was SO GOOD! Thank you. Such unique flavors. Thanks for the delicious and quick recipe.. It fit the bill Sat nt when no one felt like eating out. I didn’t really want to make dinner, either. So I appreciated the ease and speed of the recipe. It was even better the next dayy when we fought over the leftovers. (I made a double-batch, btw). Thanks Dana; I know I can always count on your for delicious recipes!!!! I agree! It was even better the next day. So yum! Made this for guests last night and our tastebuds were dancing! Every single one of your dishes are delish! I can go in making a recipe knowing it will taste amazing! There is never a hesitation and I have learned so much about plant based cooking through your blog! Thank you! I made this tonight, and it was delicious! Whole Foods was out of red curry paste so I would up using a few spoonfuls each of Sambal Oelek chili paste and sriracha. I added frozen shrimp with the peas and red pepper, and then frozen mango chunks in the last five minutes or so. Served it over roasted sweet potatoes (olive oil, salt, pepper, rosemary, lemon zest)… Amazing! I don’t often write reviews but I thought this recipe was very good (and that’s coming from someone whose tried a lot of homemade curries and is usually underwhelmed!). I followed it closely, except I only used 1 mango instead of two. Would recommend trying it as it’s a very yummy curry! Love this recipe. I was lucky to snag the single last mango in the grocery store last night, and then ran out of sugar, so it was a little hotter, but so good with the odd bite of mango! Thanks! We made this last night. I think this is one of your best recipes ever. Delicious. Tasted just like restaurant curry. Best curry yet. I absolutely loved it. I used the one cup full fat coconut milk, broccoli, chickpeas, and fresh turmeric root. A new staple for sure. Thank you, Dana. I just keep crossing recipes off from your site since I found it, and haven’t had a bad one yet. You’re amazing. I made this tonight and it was a big hit! I omitted the mango and substituted broccoli, zucchini, and mushrooms for the pepper and peas. I added a little bit more red curry paste and sugar and it was amazing! I will definitely make this again but might experiment with potatoes or red lentils (for a thicker consistency). Thank you for sharing your creative recipes! Just made this for dinner and I agree, better than take out. As mentioned above the mangos at my local store where terrible looking so I use frozen. I also added a can of chickpeas for some added protein and cut way back on the sugar. Going into my regular rotation! Delicious! A hit, for sure. I even used frozen mango and it was excellent. My kids loved it! Excited to make this but I have been having trouble finding fresh decent looking mangoes by me. Would this recipe work with frozen mango chunks? Sooo good. Made this tonight for dinner, and it was AMAZING. So quick to make AND my husband more than approved! Thanks for another great meal! I made this tonight for dinner, and it was the best homemade curry I have ever tried! And I have tried so many curry recipes. I didn’t have coconut sugar, so I subbed organic cane sugar, and I cut it down to 2 tbls instead of three. I’m planning on adding some tofu next time to get protein in, but other than that, I wouldn’t change a thing. It was delicious. Thank you for an amazing recipe. This one is going on our favorite recipe list. I also found this to be the best curry I’ve ever made. So many vegan curry recipes lack flavor, but this was full of it. Dana, is this spices? I have a 4 and 6 year old. While my 4 yo is more adventurous, my 6 yo does not like spicy. Any thoughts on how it would taste if I leave our the chili or Serrano pepper? Getting our shopping list together now. 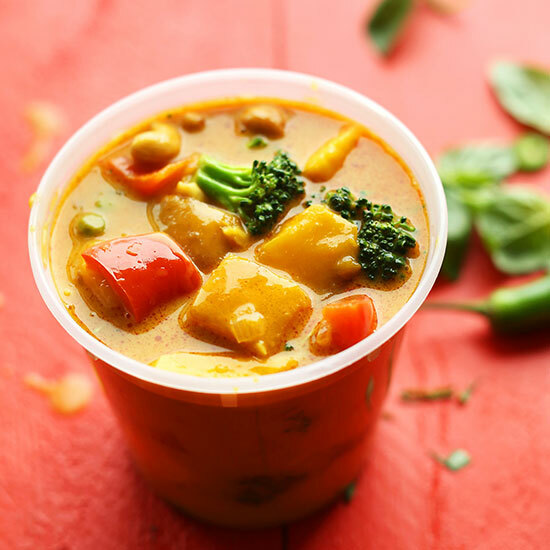 I love mango in curry, I think it will give the curry some sweetness the whole family will love. Oops I meant to ask if it is spicy. Thanks. I was dreaming of this recipe all day at work and just had to make it! Super delicious!!! My partner can’t eat mangoes so I subbed avocados instead and made the recipe with both steamed broccoli and coconut quinoa. Can’t wait to make it again – YUM! If I use full fat coconut milk, am I only using one can total? or am I using one can full fat and one can light? Yum! This will be Saturday’s dinner. We have made something similar, but never thought to add turmeric (and would like to have more of it since it’s so healthy—can’t quite bring myself to drink turmeric “milk”/tea). I’m really not protein obsessed, but will probably use some tofu in it or sue-yi (a ready made vegan simulation of fish, made from soy, with seaweed wrapped around the edges). Told my husband about this recipe—he wasn’t sure about the mango in it (even though he loves to eat it just as a fruit). But when he looked at your post, your writing and photography (and of course, the recipe!) won him over. 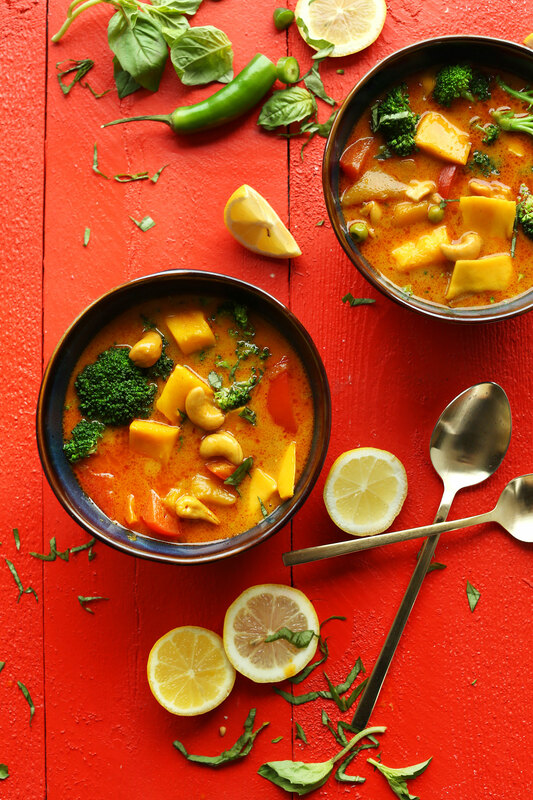 I never thought of trying mango in a curry–it sounds absolutely delicious! Is there a substitution for coconut sugar–a lot of my family members really do not like the taste of it and I was wondering if there’s a way to omit it! I left mine out, you could probably do a drizzle of agave or maple syrup for sweetness! That looks so yummy. I wonder if it will pair great with white rice. 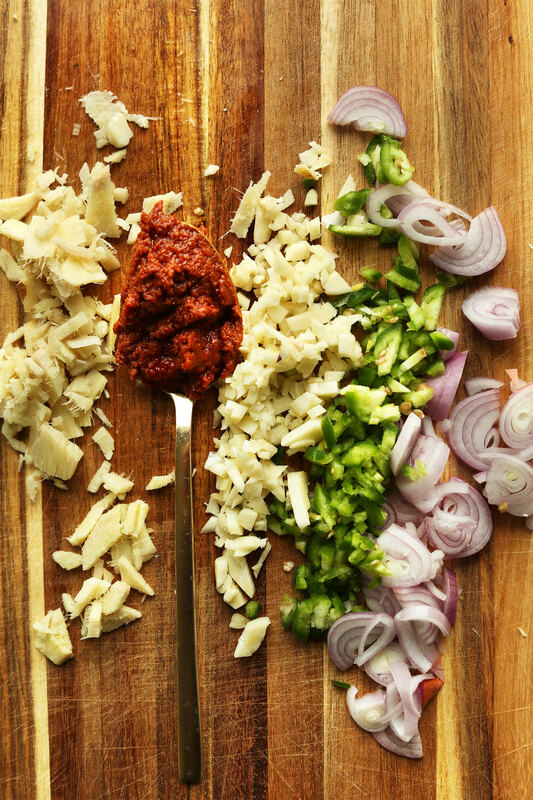 I use red curry paste all the time, it’s so versatile and easy. With your recipe, the curry paste is elevated to a whole new level. Can’t wait to try it! Yummy! I love the color! Oooooh…yeah, it’s curry weather in Wisconsin…this may happen soon!!! I’m yet to try mango in a curry but this looks lovely! Thai soup instead. It was very, very good. I made a huge pot and there’s hardly any left. Extra helpings all round for this one! The only thing I added was cellophane noodles. Very warming on a cool early spring day. Yes! I can’t believe my prayers have been answered! 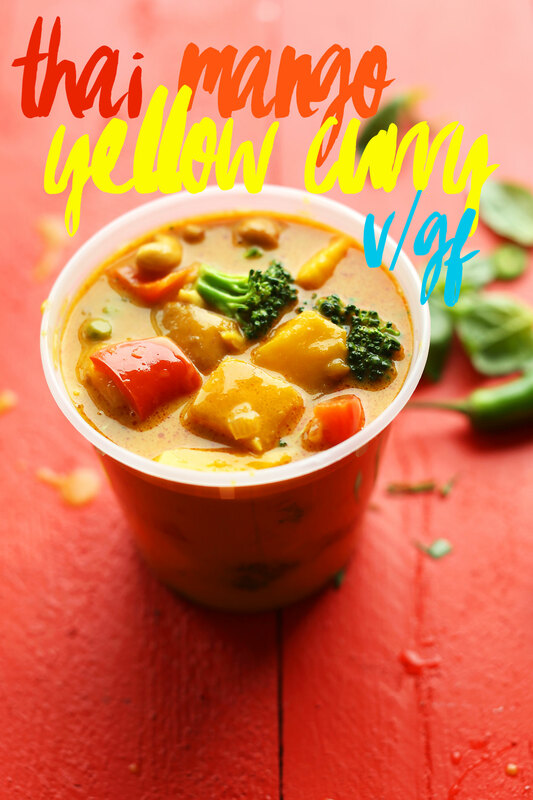 I’ve been looking for a good recipe for Thai yellow curry for a while now. I can’t wait to try this! Wow You rock!!! I always wonder I get your emails and it says baker and there is a recipe for some good vegan chow! not only that I love curry ! Thanks from the bottom of my huge stomach!! The brand Thai Kitchen’s red curry paste is vegan as well. I hadn’t run any errands yet when I read this recipe this afternoon and immediately knew what we would have for dinner. It’s delicious and full of flavors. I’ll definitely make it again. Thanks for sharing. We made this last night, but since I can’t help but stuff everything into a sweet potato, I only used 1 can of coconut milk and let it simmer until super thick. Then I spooned it over a roasted sweet potato and entered into curry nirvana. Whoa, you’re quick! Glad you enjoyed it! This looks so incredible! I’ve only made a thai curry dish at home once, but I love it then and I am sure I will love this one too. But I know I am loving the mango!! Mangoes are always a good idea! That indeed sounds delicious! My lunch seems a bit boring now. Thanks for sharing the inspiration! I have no idea how you pump out recipes this fast, but let me tell you, its pretty amazing – and they’re all so delicious! Can’t wait to make this one soon! Thai food is my favorite but rarely get it cause wife doesn’t like. I don’t suppose you do delivery? I’m a good tipper!!!! Promise. Seriously, I’d pay to have you send this meal in the mail. That mango looks awesome! Yum, we <3 curries! Next time we'll have to remember to add mango to it!